You are here: Home / Sailing Boats / Sailing Yacht Achilles 24 (fin) – Project!! Sailing Yacht Achilles 24 (fin) – Project!! THIS IS A PROJECT BOAT, NEEDS WORK! !This used to be a fun and much loved boat. About 3 years ago she was taken out of the water with all the intentions to give her a well deserved re-fit. However due to family circumstances and other commitments the project was never finished. All of the fittings have been taken off in preparation stages. Everything that has been taken off is included in the sale but will need to be put back together (some features may need replacing). There are several sails which were always stored at home in a dry and warm.At the moment the boat is on land in Cornwall approx. 30 minutes drive from Plymouth. She seats on a cradle (also included in the sale) in the boatyard where I’m sure she can remain until the works are completed (small lay-up fees apply – I think it’s one of the less expensive boatyards near Plymouth). She just needs some some love and attention so that she can be enjoyed on seas once again!Any questions, ring Pete on: 07725216378Viewings can be arranged via appointment.THIS IS A PROJECT WHICH REQUIRES WORK FOR THE BOAT TO BE USABLE AGAIN! !No reserve! You are bidding to buy!Successful bidder to collect or to arrange future lay-up with the boatyard within 14 days of auction end. This Sailing Yacht Achilles 24 (fin) – Project!! 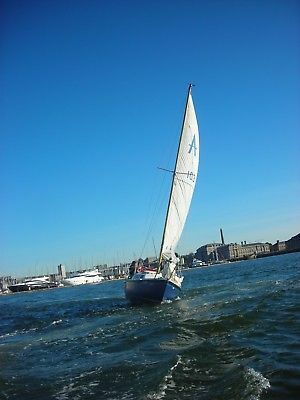 boat is located in Plymouth, PL1 3EG and is being sold on eBay by phelm.